Biomass of subseafloor microbial life is at least comparable to that in the oceans. The massive buried biosphere plays an important on a global scale, in carbon sequestration, element cycles, and Earth's evolution. 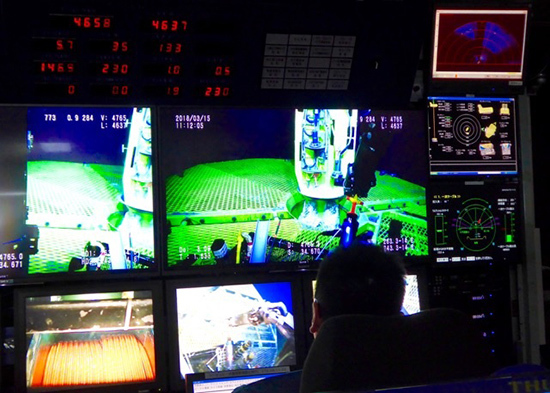 In 2012, IODP Expedition 337 unveiled the presence of microbial life at almost 2.5 km below the sea floor (Inagaki et al. 2015). But a central question of deep biosphere community remained unsolved; what is the vertical extent of the habitable zone on Earth, and by inference, the factors that limit life’s maximum depths? IODP Expedition 370, T-Limit of the Deep Biosphere off Muroto, will tackle this question by drilling through the sediments in the central Nankai Trough off Japan. Anomalously high heat flow regimes in this area result in temperatures of about 130°C at the sediment/basement interface (1210 mbsf), and make the site ideal target for an in-depth examination of subseafloor microbial life close its upper temperature limit. Observatory data retrieved successfully! 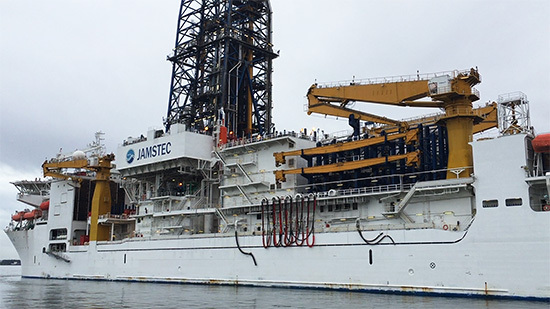 On March 15, 2018, a team of scientists returned to Site C0023 with JAMSTEC RV Kairei cruise KR18-04 (Chief scientist: Fumio Inagaki) in order to retrieve a 16-month-long record of temperature data from the borehole observatory. Using the ROV Kaiko, we inspected the well head, measured bottom water temperature, and connected successfully to the temperature logger on the CORK head for data transfer. However, no communication could be established. 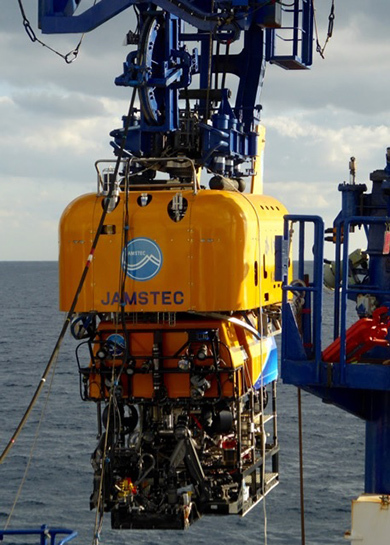 Therefore, the complete temperature logger unit was dismounted from the CORK-head and brought to the surface, together with three pushcores that had been deployed about 50 m off the well-head to sample the upper 30 cm of sediment for microbiological and geochemical investigations. Onboard Kairei, all raw data could be retrieved, although communication problems with the data logger continued. 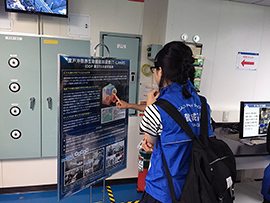 After a long night of data processing, the preliminary results were presented today to the shipboard scientists. We are delighted to report that the temperature model for Site C0023, established onboard Chikyu during Expedition 370, is now confirmed by in-situ temperature measurements down to 860.5 mbsf. Back on shore, more work will be needed to interpret the full temperature data set covering the past 16 months. Expedition movie (3.5 mins short version) is now online! Expedition movie is now online! Chikyu arrived at the Kochi New Port at 9:00 am. 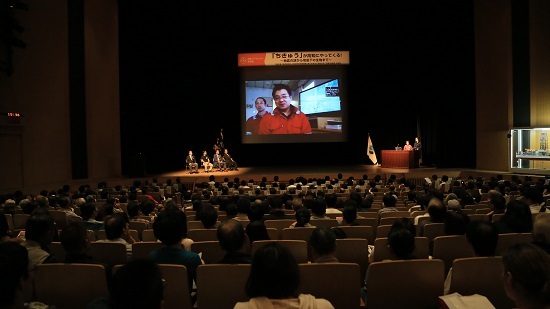 Talk event was held in Kochi Prefecture “T-Limit” project was featured with Chikyu live broadcast during the event at KCC with over 1,000 people in attendance. Chikyu departed Shimizu port at 9:00 am. Press release Start of T-Limit has been officially announced as a press release. Following the press release, the "Science Party" web page is now open. 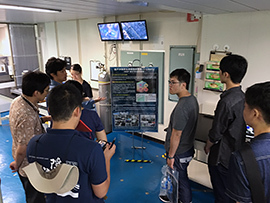 T-Limit was featured in Chikyu open ship event During the Chikyu open ship event at Ishinomaki, T-Limit was featured in the onboard exhibition. More than 3000 visitors enjoyed the tour on the ship. 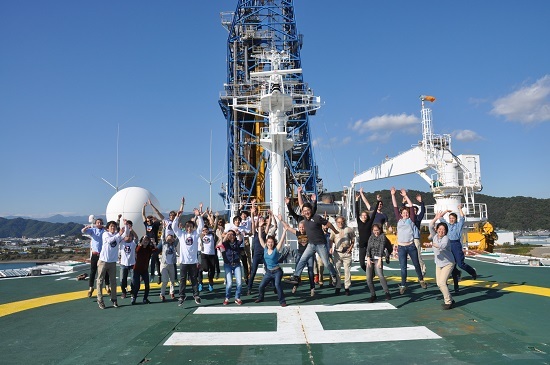 Call for Shipboard Outreach Staff CDEX invites Shipboard Outreach Staff to spend an entire expedition with an IODP Expedition 370 shipboard party. This program provides educators, artists, writers, videographers and other participants with an opportunity to translate their experiences for students and the general public via blogs, videos, social networking sites, live ship-to-shore video events and development of educational resources. 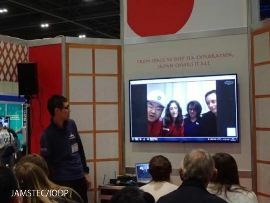 Shipboard Outreach Staff will be selected through a competitive application and interview process and CDEX welcomes applications from formal and informal educators at all levels, as well as creative individuals who have a passion for IODP and the skills and potential to increase the profile of the program in the public eye. The application deadline is July 18. More details and application form are available for download. "Scientific Prospectus published" Full version of scientific prospectus is now published online. Drs. Verena Heuer, Fumio Inagaki and Yuki Morono serve on Expedition 370 as Co-chief Scientists. Three co-chief scientists officially accepted the invitation of CDEX to serve on the IODP Expedition 370: Dr. Verena Heuer (MARUM, Univ. Bremen) is an organic geochemist who has been working on biogeochemical processes in the deep subseafloor biosphere. 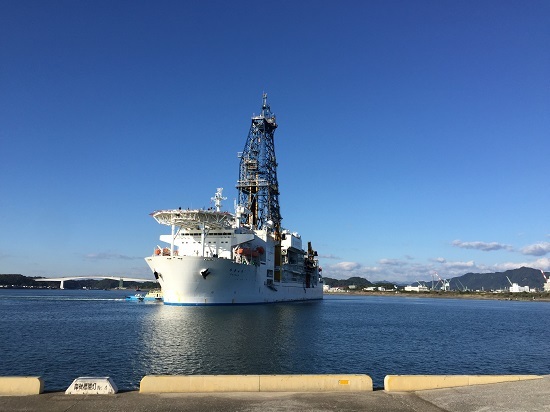 Dr. Heuer has a lot of field-based research experiences, including IODP Expeditions 301 and 311 on the JOIDES Resolution, 322 and 337 on the Chikyu, and is interested in biogeochemical carbon and other elemental cycles. 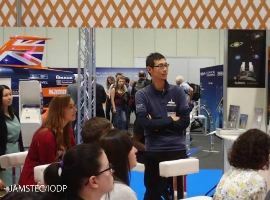 Dr. Fumio Inagaki (KCC/ODS, JAMSTEC) is a geomicrobiologist who has also sailed in scientific ocean drilling many times as a shipboard scientist (ODP Leg 201, IODP Expeditions 301 and 316) and a co-chief scientist (Expeditions 329 and 337), and is the first AGU Taira Prize recipient in 2015 for the contribution to the deep-biosphere frontier research. 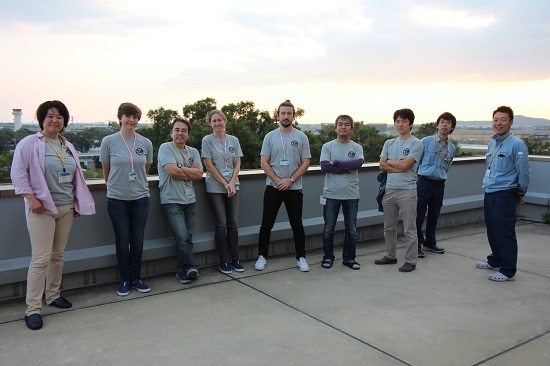 Dr. Yuki Morono (KCC, JAMSTEC) is a geomicrobiologist, who participated in IODP Expeditions 329, 337 and 357. Dr. Morono has been long working on microbiological techniques such as cell detection and enumeration at low-biomass core samples, and is going to be a leader of the shore-based team of the science party. These three co-chief scientists, nominated by the Project Coordination Team (PCT), will lead the science party of Expedition 370. Chikyu arrived at the Kochi New Port. Drs. Verena Heuer, Fumio Inagaki and Yuki Morono serve on Expedition 370 as Co-chief Scientists.